Sowing is an important step towards successfully growing sorghum, and is thus not to be taken lightly. The seeds are small in size and require higher temperatures than other summer crops. The temperature at the time of sowing needs to be 12°C minimum, while the seed bed needs to be prepared with care, so as to enable regular sowing and good soil-seed contact. Each seed should be placed at 2 to 4 centimetres in wet soil. Select a variety with earliness so that flowering occurs in July and maturity – harvesting by 15 October. Generally speaking, the month of May is the optimal time for sowing. In some regions, the soil temperatures can reach 12°C from as early as the second half of April, making it possible to start sowing. In the warmest regions, it can be sowed until late June as a catch crop, with very early varieties. – To the variety: the earlier it is, the lower the number of grains per panicle. However, this is fully offset by the higher sowing density compared to later varieties. – To the available storage capacity of the soil: in drying soils, overly-high sowing densities foster biomass production that heightens the competition between plants and speeds up water reserve depletion. In the event that irrigation is possible or where the soil has high water reserves, higher sowing density makes it possible to maximise yield. 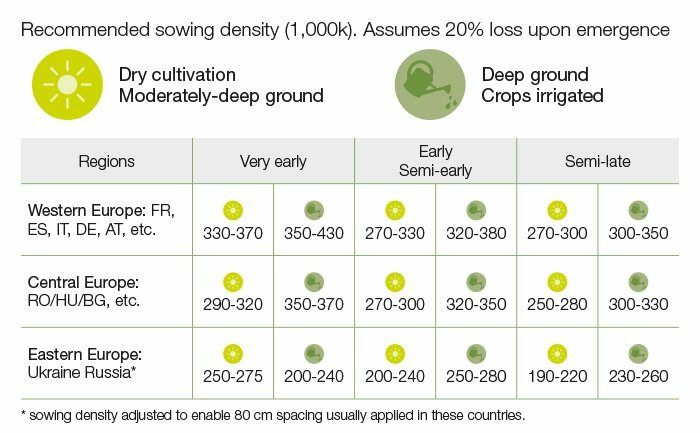 Sowing density as a function of the variety of the variety earliness group, the soil type and assumed 20% loss upon germination. The inter-row spacing can range from 30 to 80 cm, though the optimal distance is 40 to 60 cm. 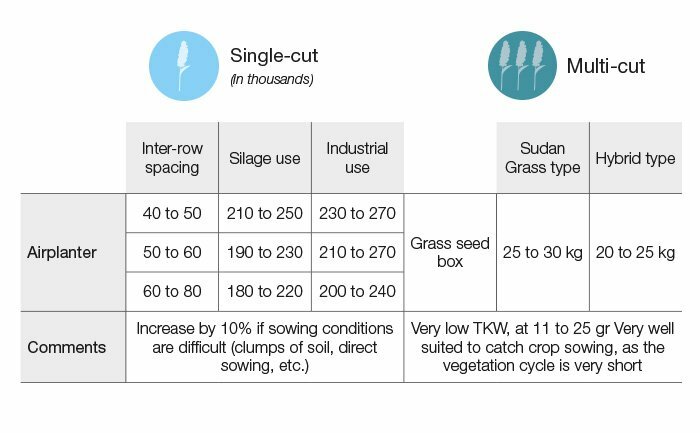 Ideally, a single-seed drill will enable better seed placement depth, though sowing can also be performed using a grass seed box (closing every other row). Lastly, whatever the instrument used, the loss rate upon germination must be taken into account. Under good conditions, it is around 14 to 20%, but can be higher under adverse seed placement conditions (poor seed quality, cold soil, etc. ).